Now two Galleries, the Serpentine responds to the unique location of Kensington Gardens by presenting an expanded programme of contemporary art and architecture that follows the seasons of the year, with exhibitions timed to take place in autumn, winter, spring and summer. The wider programme, including the Pavilion, the multi-disciplinary Marathon, the Bridge Commission Audio Walks and an ongoing outdoor commission with The Royal Parks,is augmented by a range of public events designed to give visitors of all ages the opportunity to engage with the work on show in greater depth. The newly opened Serpentine Sackler Gallery, designed by Zaha Hadid Architects, gives new life to The Magazine, a former 1805 gunpowder store, located five minutes' walk from the Serpentine Gallery across the Serpentine Bridge. With 900 square metres of new gallery, restaurant, shop and social space, the Serpentine's second space in Kensington Gardens is a new cultural destination in the heart of London. The Magazine Restaurant is adjoined to the gallery. 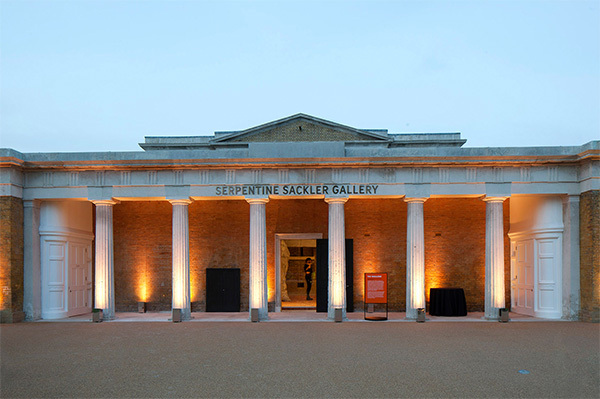 Find out more about the Serpentine Sackler Gallery. Established in 1970, the Serpentine Gallery has presented pioneering exhibitions of 1,600 artists over 43 years, from the work of emerging practitioners to the most internationally recognised artists and architects of our time. Each summer, the Serpentine commissions an architect who has not previously built in the UK to design a temporary Pavilion for the lawn in front of the Gallery. This annual architectural commission is a venue for the Gallery's public programmes and a cafe. Koenig Books, offers a wide range of international titles on contemporary art, photography and architecture. During exhibitions the galleries are open Tuesday - Sunday 10am - 6pm. The Magazine restaurant is open Wednesday - Saturday 10am - 11pm and Tuesday and Sunday 10am - 6pm. To find out about current exhibitions please visit The Serpentine Galleries website or telephone 0207 402 6075. The Serpentine Galleries, The Magazine restaurant and the annual Pavilion are available for private hire. Offering a spectacular setting for exclusive events, the Serpentine's unique spaces are available individually or together to accommodate a range of events from champagne breakfasts, cocktail receptions and elegant dinners to corporate parties and launches. For details about entertaining at the Serpentine Gallery, download the Serpentine Gallery hire brochure. 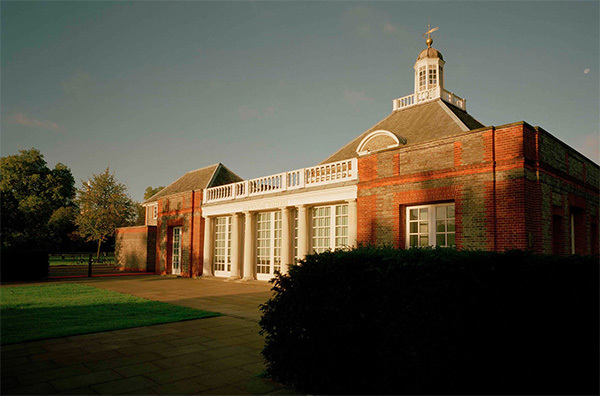 The classical-style Serpentine Gallery was built in 1934 as a tea-room. It replaced an earlier refreshment house that had been added to Kensington Gardens in 1855. The Serpentine Gallery opened here in 1970 and established an international reputation for pioneering contemporary art. Artists who have shown here include Henry Moore, Andy Warhol, Rachel Whiteread and Damien Hirst.